Dr Rajat Chattopadhyay is a leading academician and practitioner, Head of the Department in Medicine at Mahesh Bhattacharyya Homoeopathic Medical College Calcutta. He had presented many papers in seminars, authored books and articles, received awards from reputed organizations. Here he presents a case of Poly Cystic Ovarian Disease. 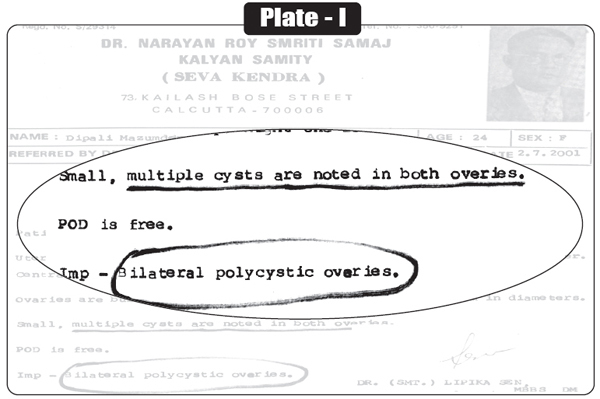 Her blood parameters are normal and Ultrasongram of pelvis reported “ Multiple cysts in the ovary"
· Physical constitution – short but stout with dark complexion. · Chilly patient; general aggravation in winter. · Desire for egg, fish, extra salt, salted food++. · Moderate thirst for large quantities at long interval. · Stool hard, occasionally with mucus. · Urine clear at regular interval. · Dream of dead persons (specially of her dead father), falling from the height++. · Tongue – large, flabby and moist with little whitish coating & imprints of teeth. · Palm – warm & moist. · Teeth have irregular alignment. · Mind - Co-operative but suspicious. · Weak memory, with difficulty to express her troubles. · Character of the menstrual blood – clotted, black. · GENERALITIES, FOOD, onions agg. · Lycopodium, Phosphorus scored highest & got 15 each,covering the seven symptoms out of ten symptoms. · Thuja got 13 marks and covered the eight symptoms out of ten symptoms. · Lycopodium and Phosphorus scored highest & got 15 each, but Thuja covered the eight symptoms out of ten symptoms. After consulting with Materia medica, Thuja is preferred to be prescribed first. Typical sycotic background, sycotic constitution, chilliness of the patient gave more importance to prescribe Thuja. Thuja occidentalis 30 / 4 doses OD on 12/06/2002. Patient was advised to come after 45 days.First two months there was no such improvement, but in general there was no aggravation and patient was in good condition. Her appetite, sleep, thirst all were normal. After two months the painful menstruation was not so severe as it was in the past. The general feeling of the patient was much better. The character of the blood was also changed from black to reddish and there was no clot (in the last menstruation). Since after the first prescription only placebo was prescribed in different form from time to time. 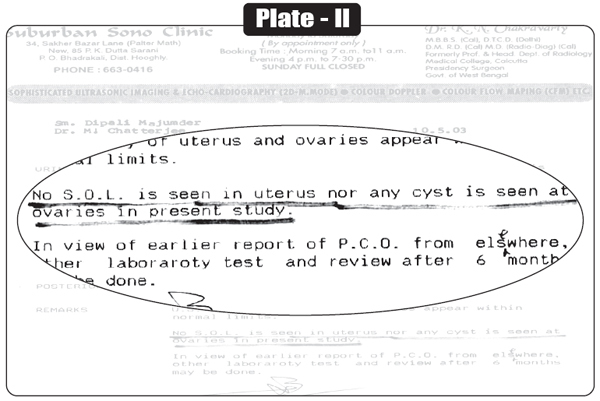 Ultrasonography done on 10/05/2003, and study of uterus & ovaries appeared within normal limits with no evidence of any cyst seen in ovaries Since then till today patient is better and there is no complaints of irregular or painful menstruation. Refer the plates I and II.